Batteries: Ever Ready B126 or Vidor L5512 (90v HT) & Ever Ready AD35 or Vidor L5040 (1.5v LT). The covering on this suitcase portable is described as 'blue art leather' - whatever that is! The deck is very attractively finished in brushed metal and grey stripes. 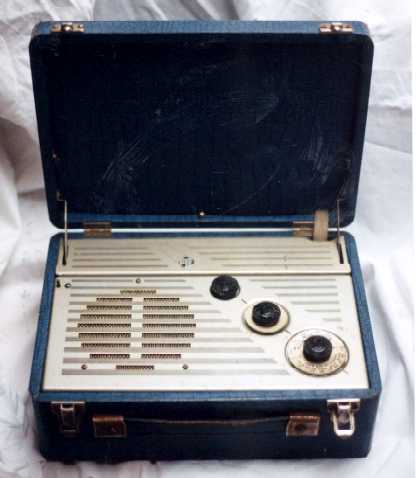 Of all the portable radio manufacturers of the time, Pye seemed to have some of the better designs.